HalaPlay is a fantasy platform where you can put your sports knowledge to test and win real cash. And yes you will get an extra referral cash bonus of Rs. 50(total Rs. 100) when you sign-up with a referral code. If you sign up without a referral code you will get just Rs. 50 sign up bonus. On Halaplay you can play fantasy sports like Cricket, Kabaddi, and Football. If you play fantasy sports on Dream11 you know that they recently extended closing time for the contests. Now you can edit & create teams and join contests till the match starts so that you only select the players that are playing. But did you know that HalaPlay has always had that? In fact, HalaPlay was the one to introduce that concept. You can use this referral cash bonus to join leagues and win cash. You can also earn Rs. 50 for every friend that you refer to HalaPlay. You will earn the referral bonus when your referred user joins a paid league. Another thing that I liked about HalaPlay is that you can use 100% of your (referral & sign up)cash bonus to join leagues with “_B” symbol. There are 3 types of bonus leagues 1B, 2B and 4B. It means that you can use 100% cash bonus for 1, 2, 4 entries respectively. Cash bonus: 1. Cash that you earn when you enter a referral code during sign-up and for registration 2. Cash that you receive when others enter your referral code and join a paid league. 3. Bonus that you get during offers and discounts. 1., First, you need to select a match from the Match Center(website) Arena(App). You can also see a timer under each match that tells you how much time you have before the leagues are closed. 2. Go to My Teams tab, hit the Create Team button. 3. You have a salary cap of 100 credits. You need to select 11 players without exceeding this limit. While creating your team you need to keep in mind the format of the match, pitch, conditions and of course, players. If you are creating your team after the line-ups are out there will be a green dot next to every player in the playing-11. 4. Once you have created your team hit SAVE and select the captain of your team. The points of the player selected as captain will be doubled. There is no vice-captain. You can create multiple teams, up to 4. You can copy the created team to create other teams or start from scratch. Now you are ready to join some leagues. Well, these leagues are normal. Higher points = bigger prize. Head-to-Head are leagues with two participants and one winner. Reverse fantasy is the opposite of normal fantasy. In reverse fantasy, you have to select players who score the minimum points in a match. If a player does not play in a match then the highest point scored in the match will be awarded to that player. Captain in reverse fantasy gets their point halved. (If your captain has scored negative points in a match then points will be doubled since winning criteria of reverse fantasy is to create a team which scores minimum points). You can join any league that you want. But if you only have Cash Bonus in your wallet you can only join leagues that have 1B, 2B or 4B symbol. 1B: You can join with 1 team using 100% of the cash bonus. 2B: You can join with 2 teams using 100% of the cash bonus. 4B: You can join with 4 teams using 100% of the cash bonus. HalaPlay hosts 1 league that the players can join for free and win cash prizes. But these leagues(with free entry)are only offered for popular matches like the matches of IPL. You can earn Rs.50 cash bonus for every user that enters your HalaPlay referral code during sign-up. Your friends will instantly get Rs. 100. But you will get the bonus when they join a paid league. One of the things that I liked about HalaPlay is that you can pay 100% of entry fees of contests/leagues using your referral bonus and cash bonus. There are no restrictions. You can join as many leagues as you want and spend as much of the bonus as you feel like. Before you can withdraw your winnings you need to verify your email address, PAN and bank account. Use Coupon Code WELCOME and get 100% bonus on your first deposit when you deposit between Rs. 10 to Rs. 50. Deposit exact Rs. 12,000 and get 25% Bonus. This coupon can only be used once. Deposit exact Rs. 1,500 and get 30% cash bonus. Can be used once. Deposit between Rs. 1 to Rs. 99 and get 20% bonus. You can use this coupon 5 times. Get 15% bonus when you deposit Rs. 1,000 to Rs. 9,000. You can use this coupon 5 times. Get 10% bonus when you deposit between Rs.10,000 to Rs.100,000. You can use this coupon 5 times. Get 10% bonus on your deposit of Rs.10,000-Rs.100,00. This code can be used 5 times. Get 5% bonus when you deposit between Rs. 10,000 to Rs.500,000. Get 100% bonus. For Rs.25. 50% bonus when you deposit Rs.100. As you might already be aware that every fantasy sports apps/platforms have a different fantasy point system. While it’s correct that your team will score higher if the players perform well. But for different platforms, you might have to create different teams. Even if the difference is of just one player. Let’s understand this with the example of MyTeam11 and Dream11. For a T20 match, your team will earn 0.5 points for every run scored. While on MyTeam11 your team will get 1 point per run scored. And on MyTeam11 half-century bonus is 4 points and the century bonus is 8 points. For a wicket taken your player will get 10 points on Dream11 and 14 points on MyTeam11. So on Dream11 20 runs = 1 wicket. And on MyTeam11 14 runs = 1 wicket. 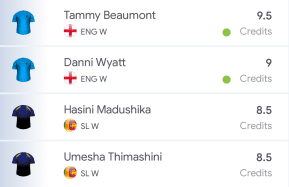 As you can see on MyTeam11 it is better to select more batsmen as compared to Dream11. So the question now is: What should your HalaPlay team look like? The fantasy point system of HalaPlay is basically 2x the FPS of Dream11(with some minor differences). So your HalaPlay team should be similar to your Dream11 team. But sometimes a player costs less or more in HalaPlay. So that’s when you need to decide whether you are gonna leave a high credit player for good players or your gonna select a player that costs about 10 credits and select poor performing player that costs 8 credits. For example, my HalaPlay team for KXIP vs MI had 3 all-rounders and not Chris Gayle but on MyTeam11 I had him in my team. Gayle scored 99. I lost on HalaPlay won on MyTeam11. So while on MyTeam11 Batsmen have an advantage over bowler on HalaPlay your team needs to be balanced. Always create your team according to the "Pitch Report". After you have read the pitch report you know whether the pitch is good for spinners or seamers. Whether it’s a high score pitch or low score. Last thing: Don’t stress too much. When Dream11 was new I used to spend hours, viewing the scorecards of previous matches, reading match previews, news and constantly making changes to my fantasy team. But slowly I came to realize, it doesn't matter how much time you spend creating and editing your team. Just listen to your heart. And if you don’t feel like playing fantasy sports/cricket sometimes, it’s better if you don’t. If you are having a hard creating your fantasy team you can Google: "HalaPlay team prediction”. Many blogs share their tips and teams. Just view these teams when you are confused. HalaPlay helpline number: they don't have a helpline number. HalaPlay is one of the most famous and trusted fantasy platforms in India. And like every other fantasy sports platform you will get Rs. 100 cash bonus when you enter a referral code during sign up. You can use this cash bonus to join paid leagues and win cash without depositing anything. So, if you are running low on cash in Dream11 account, try HalaPlay and use your cash bonus to win more. And if your friends haven’t joined you yet, refer them to HalaPlay and get a referral bonus of Rs. 50 for every friend that registers with your referral code and joins a league. Your friends will also get a signup bonus of Rs. 50.